Used in ancient China, and is documented in The Divine Farmer’s Herb-Root Classic (dated to around 2700 BC). Rhubarb is believed to have been used as a laxative for at least 5,000 years. May also be useful for diarrhea, liver and gall bladder complaints, hemorrhoids, menstrual problems, enhancing appetite, promoting circulation, relieving pain, intestinal infections, and reducing autoimmune reactions. Tea: Simmer 1 teaspoon of powder to 1 cup of water for 10 minutes. Drink 2 times per day. Tincture: 1-2 ml 3 times per day. POSSIBLE SIDE-EFFECTS AND SIGNS OF TOXICITY: Rhubarb is fairly safe especially if not taken medicinally for more than 8 days. Some side effects that may occur include stomach pain, intestinal pain, watery diarrhea, uterine contractions, bone loss, potassium loss, muscular weakness and irregular heartbeat. 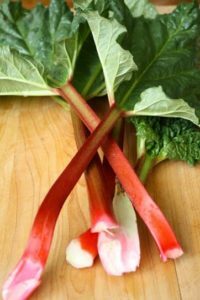 Beware of using rhubarb if you have a history of digestive issues or kidney issues. Stomach and intestinal pain, watery diarrhea, uterine contractions. Long term use may cause: muscular weakness, bone loss, potassium loss, irregular heart rhythm. Do not use if you have a bowel obstruction, appendicitis, unexplained stomach pain, or inflammatory conditions of the intestines (such as Chron’s disease, colitis, or irritable bowel syndrome). Laxative, has an astringent effect on the mucous membranes of the mouth and nasal cavity, anticholesterolemic, antiseptic, antispasmodic, anti tumor, cholagogue, demulcent, diuretic, laxative, purgative. May also be useful for diarrhea, liver and gall bladder complaints, hemorrhoids, menstral problems, enhancing appetite, promoting circulation, relieving pain, intestinal infections, reducing autoimmune reactions. Used topically for burns and cold sores. Rhubarb is believed to have been used as a laxative for at least 5000 years. It was used in ancient China and is documented in The Divine Farmer’s Herb-Root Classic (dated to around 2700 BC).